Oxygen needs to be able to get into the pond and fish create gases, as well as organic material in the water. Proper gas exchange (gases out, oxygen in) needs to be possible even during the winter months. Pond de-icers and heaters - or stock tank heaters, are used to provide just enough heat so that the a small amount of water around it doesn't freeze. 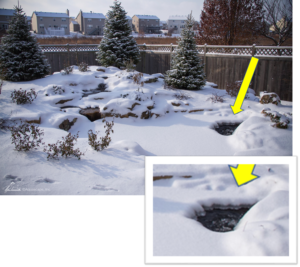 While a layer of ice over the pond does not necessarily hurt anything, a hole needs to be maintained for gases to escape so that the fish don't suffocate. Deicers generally have a thermostat on them so that they turn off when the water temperature is up to 70 degrees. Make sure the de-icer you purchase has this feature! Not a good idea to put a de-icer in a skimmer. If the heater comes into contact with the skimmer side it can actually start a fire! We had a customer whose de-icer started his skimmer on fire. The heat caused the skimmer to burn, which then led to water escaping the skimmer. 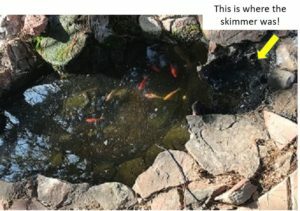 The skimmer went dry and continued to burn. Position deicers away from anything that it may burn.